If you have ever found yourself walking along a Georgian street, imagining what it must have been like to wander there when the houses were newly-built, fanlights newly-polished and panelled doors freshly painted; mused awhile about the inhabitants, from footmen to fine ladies in their high-waisted fashions - then 'The Coroner's Daughter' is a book for you. Wicklow author Andrew Hughes has managed to take us inside a typical Georgian townhouse in Dublin, back in 1816, breathing life into the tall five-storey main stay of the Dublin landscape. 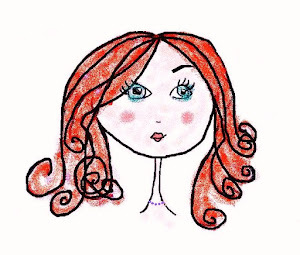 In the character of Miss Abigail Lawless of Rutland Square, (now Parnell Square) we are presented with a heroine unlike those of contemporary novels such as those by Jane Austen. Abigail may be as curious as Elizabeth Bennet, who also faces the failings of a beloved father, but the similarity ends there. Hughes's creation is if anything more like a modern woman than a creature of her time. She expects to be seen as any man's social equal, possibly because her father treats her that way, but she is not at all resigned to the inequality of her time as one might expect. In that way, Abigail reminded me of a kind of time traveller, like Claire Randall from Diana Gabaldon's 'Outlander' series- a modern woman who finds her self cast adrift in the past. 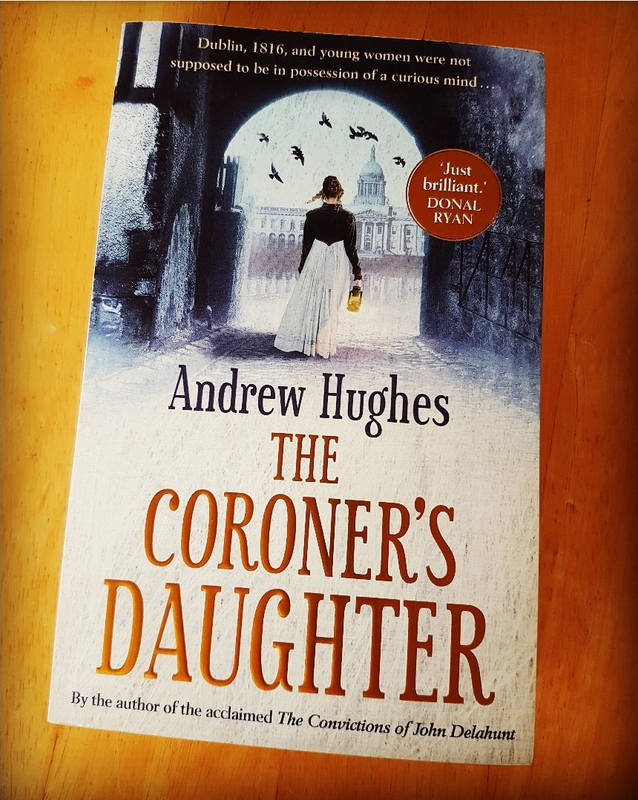 Abigail Lawless expects to accompany her father to a medical lecture at The College of Surgeons, takes carriage trips out of the city on her own, wandering the streets of Dublin alone, down its back alleys and thoroughfares. We know from contemporary letters by Jane Austen that such independent journeys were unheard of - Lizzy Bennet is made fun of for visiting a local neighbour alone and on foot and that was in the relative safety of a small rural village. For Jane Austen herself carriage rides unaccompanied through London were a shocking luxury and most unusual- she could only afford such freedom at the pinnacle of her literary success when she was in her late 30s. But young Abigail Lawless (living up to her name perhaps?) cares little for such social mores. Instead, she follows those she suspects of murder down dark alleyways or to lonely, derelict country houses, to challenge them outright. But we must remember that being a Georgian heroine, she has not had the advantage of reading the Miss Marple novels and knows little of the art of trapping the guilty by stealth, and with the assistance of a willing police constable! Again and again, Abigail places herself in great danger, (not unlike Lydia Bennet perhaps?) but in this case it is her passionate desire to know solve a puzzling crime that persuades her to leave the security of her father's house. In the character of Mr Darby (not Darcy!) we are presented with a dark villain worthy of the name, and in Ewan Weir, her father's young student, we find a charming Scot and fitting side-kick for Abigail. There is undeniably a romantic spark between them, but also a professional respect and a mutual interest in pathology that sets this pair up as a great crime-solving duo who may have numerous crimes to solve in the future. The ending certainly opens the way for one sequel if not more. The very thought delights! 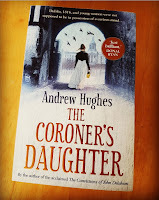 If you are prone to dream about those who first inhabited Georgian Dublin, then you will most likely want to shake Andrew Hughes by the hand and thank him for his novel 'The Coroner's Daughter' - for he has kindly done the dreaming for you. -A must read for Austen fans and Dubliners alike.